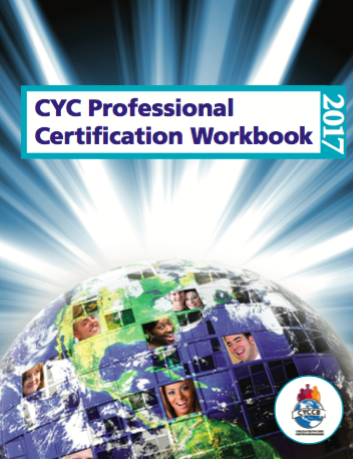 Over the past year CYCCB and the CYC Certification Institute have been collaborating to integrate the Entry, Associate and Professional level certifications under the umbrella of CYCCB. All of these certification levels are based on the same competencies, use the same methods of demonstration (standardized, normed exams; colleague and supervisor references, documentation of relevant practice experience and education), promote use of the Standards for Practice of North American CYC Professionals, and document training in the five core competency areas included in the Competencies for Professional CYW Practitioners. Both prepare workers for employment in any practice setting in the CYC field. Together they represent the best effort of the CYC professional community to create a meaningful, transportable, widely recognized credential that documents competence across practice settings and geographic areas. Over the past 20 years the certification programs were implemented by two different groups working to accomplish the same goals. The CYC Institute Entry and Associate levels were implemented in the 1990s to provide a place for practitioners to enter the CYC career development process and move upward into more advanced intermediate practice. In 2008 the CYCCB Professional level certification was launched to define the characteristics of fully competent practitioners at the top of the field. Together the three level system offers a road map for professional CYC practice that extends across a practitioner’s career life. CYCCB and the CYC Certification Institute collaborated during 2017 to refine the fit between the programs. Over the 20+ years that the two certification boards have been sponsoring certification, differences in board policies and evolution of thinking regarding certification practices led to differences in how the programs were implemented. Small differences in certification requirements, renewal policies, and other requirements have caused confusion for practitioners using the systems. The two organizations decided to fully review all certification requirements during the integration process to address differences so that a seamless user-friendly system can be implemented. The integration will be accomplished through a licensing agreement that allows CYCCB to become the primary source for all levels of CYC certification. This is similar to the existing licensing agreement between the Association for Child and Youth Care Practice (ACYCP) and CYCCB that allows CYCCB to implement the Professional Level (CYC-P) certification owned by ACYCP. All forms have been rebranded for consistency. A new CYCCB website has been implemented that describes the new integrated system. The CYC Certification Institute website has been replaced with a message sending people to the www.CYCCB.org website. Announcements are going to all certified practitioners announcing the system changes and new policies.